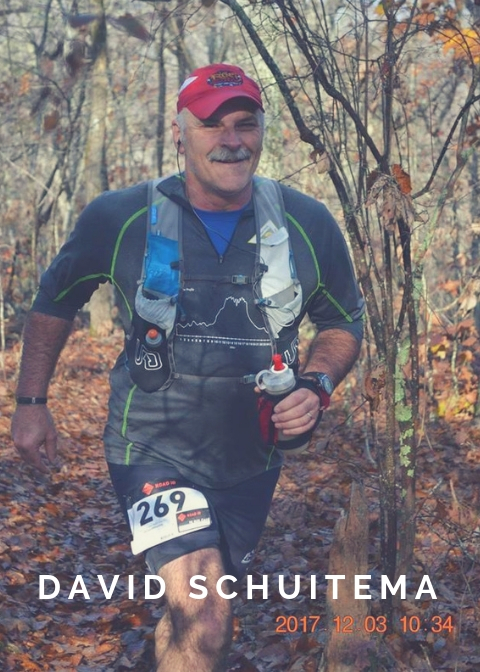 David Schuitema Bio – Revolution Running Co.
I’m 58 years old, a husband of 30 years, father of 3 and recently the grand father of 2. I have loved running since I was a little kid. In school, I played basketball and football. Running was just a fun form of training for me. I was 24 before I ran my first official 5k race. That opened up a whole new world for me. I realized there were other people out there that loved running as much as I did. None of my family or friends were runners, so I was kind of the oddball out running the country roads by myself. Over the years I gradually dropped other sports but I kept running. It was the one thing I could still do, though a lot slower than I used too. A couple of years ago, I was introduced to this crazy group of runners from the south side of Atlanta. I have since been introduced to trail running (which I love!) and ultra distance running (which I find intriguing and challenging) 80 miles is my PR for distance so far. I love this running community with it’s broad cross section of people of all walks of life. The common denominator seems to be of the heart. I believe that is where the drive comes from to push ourselves to do the things we do. To encourage each other to dream big and take the chance knowing that others are there supporting your efforts. My motto is “Run4Fun” As long as I can keep that in mind and possibly encourage someone else along the way, I’ll be out there somewhere, on a trail, track or dusty road enjoying the benefits of running. Happy Trails!